Amid new developments in the case of two beloved Bay Area construction workers facing deportation, the workers received a major boost this afternoon when 11 Members of Congress, led by the men’s representatives, Jared Huffman (D-San Rafael) and Eric Swalwell (D-Dublin), sent a letter to SF ICE Director David Jennings urging ICE to “seriously consider any available alternatives to deportation.” The letter cites the two fathers’ significant community support and the great hardship their deportations would cause to their families. The letter comes after an immigration judge, in a narrow review, denied Rodrigo Nunez the opportunity to have a full hearing late yesterday. Despite the similarities in their cases, a decision for Hugo Mejía is not expected until next week. In the narrow proceeding, the immigration judges hands’ are largely tied and they are only able to look over a denial issued by the Trump administration’s Asylum Office. On the heels of the denial for Rodrigo, the legal team has filed an urgent request for review with the US 9th Circuit Court, which will be decided upon in a matter of weeks. Joining non-profit Centro Legal de la Raza on the legal team is the firm of Van Der Hout, Brigagliano & Nightingale, LLP. “We welcome the strong support of these Members of Congress. Today’s results are further proof of how unjust the deportation system is. But Rodrigo and Hugo are beloved fathers, workers, and community members, and thousands of people are fighting for them. We won’t stop until they are free,” said attorney Lisa Knox of Centro Legal. Hugo Mejia (far right) with his wife and children. Hugo and Rodrigo are Bay Area construction workers, community volunteers and fathers of US citizen children who were nabbed by immigration agents at Travis Air Force Base on May 3, 2017. They were sent to work on a hospital on the base by their construction company. 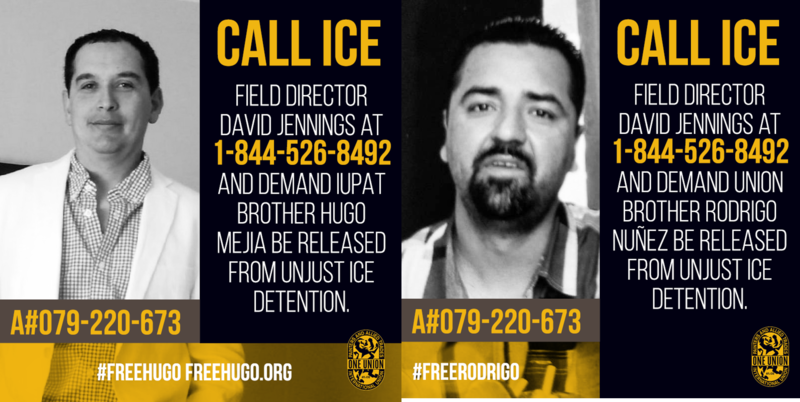 When they could not provide proof of their legal status to military officials, Hugo and Rodrigo were held in handcuffs for about two hours until ICE came to arrest them and took them to immigration detention. The case has caused widespread outcry among labor, faith and community groups IUPAT, the International Union of Painters and Allied Trades, of which Hugo is a member, organized a week of action in support of the two workers. The California Labor Federation, representing 2.1 million members, is also calling for their immediate release. Both men were deported once before, in 2001. ICE is cynically trying to use 16-year old deportation orders issued by an immigration agent at the border, not a judge, in order to deport both Rodrigo and Hugo immediately. Neither man has ever received a hearing before an immigration judge. Both men are beloved long-term residents of the United States for over 15 years. 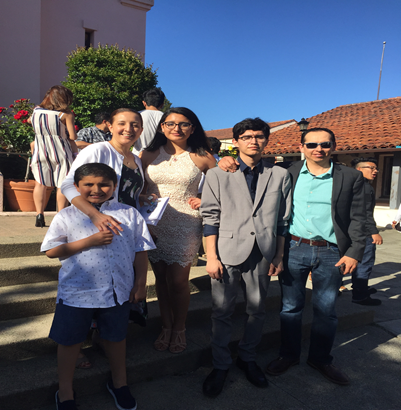 Hugo lives in San Rafael with his wife, Yadira and his three young children. His elder two children have been granted DACA, and his youngest is a U.S. citizen. Hugo is a foreman at S&R Drywall. He volunteers at his children’s school which is connected to the local synagogue. His congressman, Jared Huffman, is involved in efforts to free him from detention. Rodrigo lives in Hayward with his wife and his three young children, all of whom are U.S. citizens. He is an assistant coach for his son Sebastian’s baseball team, and volunteers at his church. The attorney representing them has received over 200 letters of support from community members.